Banks are the places not only giving customers promising futures but also potential risks whenever transaction is undergoing. With the advanced technology, banking security has become more challenging under different operation circumstances, such as ATMs, personal visit to branch offices or self-service banking station. A well-integrated and reliable surveillance solution will help secure customers' financial assets and safety for all people in this environment in every aspect. Banks require the solution provides sufficient reliability for long-term operations. Besides, the cameras has to support clear images with high quality, regardless of different kinds of environments or applications. The data retention of recorded video is particularly important to the planning and acceptance of bank security projects. Banking security often requires a distributed structure with centralized management. In addition, the solution has to be scalable, enabling customers to add cameras at individual locations or expand the coverage of the solution to include even more locations. 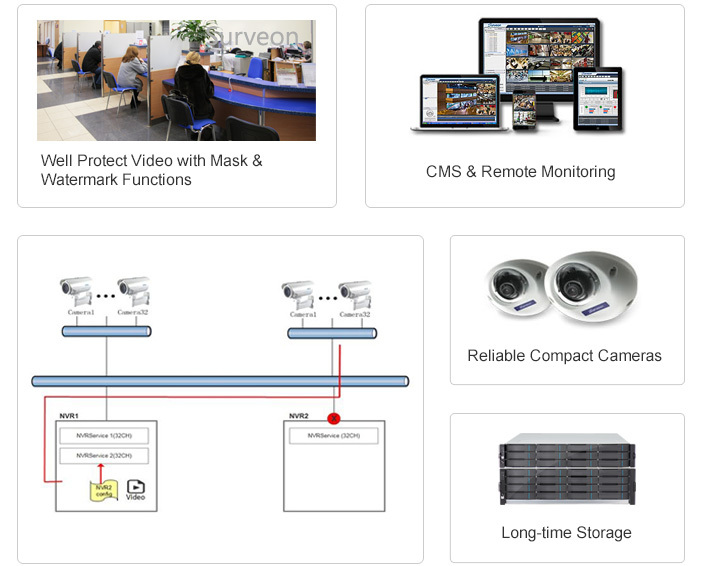 Surveon provides video protection mask and watermark functions, offering higher values for privacy and authenticity needed for banking application. 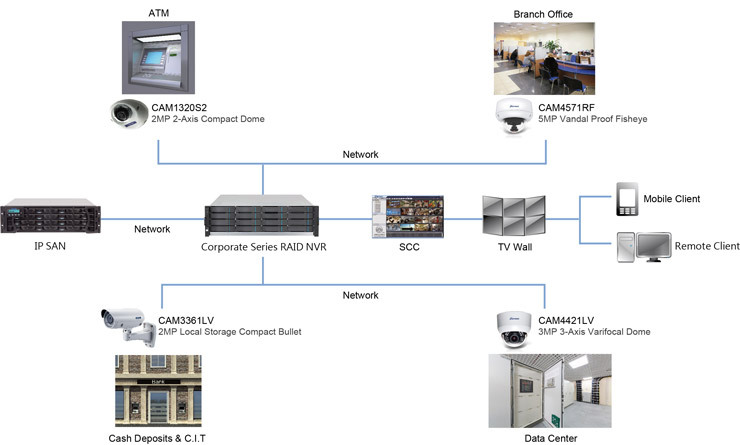 With the Surveon Control Center (SCC) remote monitoring and centralized management, bank operations become easier and surveillance costs can be reduced. Surveon compact series camera provides excellent megapixel image quality even under complex light conditions, protecting banks and ATMs from potential threats. Provide large capacities for 1 year non-stopping recording. Without using spare NVR, Surveon Failover solution allows failover NVR to work normally and only use failover licenses to take over recording from the failed NVR when needed, ensuring no video loss for mission-critical applications like banking surveillance.